00:15:00 Makes 4 servings, 1/4 recipe (321 g) each. Makes 4 servings, 1/4 recipe (321 g) each. That's right - one dish is all it takes to get this fish and rice casserole on the table. Even better - our One-Dish Italian Fish recipe is ready in 15 minutes! 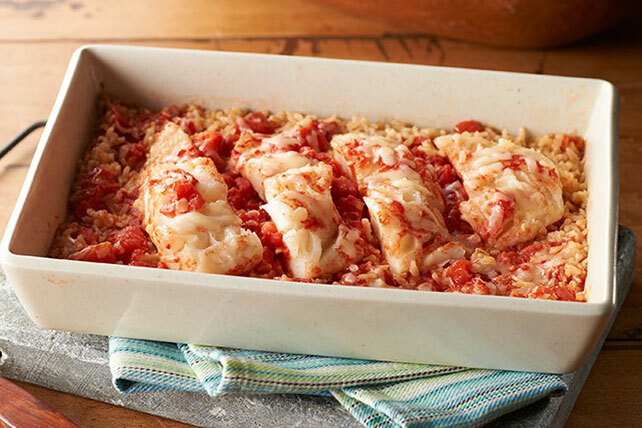 Combine rice and water in microwaveable 1.5-L casserole dish; top with fish, tomatoes and dressing. Cover. Microwave on HIGH 10 min. ; top with cheese. Microwave, uncovered, 2 min. or until fish flakes easily with fork and rice is tender. The microwave is ideal for cooking fish since it helps keep the fish moist and tender. If your microwaveable casserole doesn't have a lid, cover with waxed paper instead. Prepare using cod or tilapia fillets. Looking to add more fish to your diet? This flavourful meal is sure to win over both you and your family. And as a bonus, the tomatoes provide a good source of vitamin C.
Serving Size Makes 4 servings, 1/4 recipe (321 g) each.